There are many ways to recognize your intuition that you may be missing. So many times I’ve heard my husband say, “I don’t have a psychic bone in my body.” He claims that he’s never experienced a single intuitive episode in his entire life. How much of that do you think is simply because he believes it? If you want to recognize your intuition, you’re going to have to, first and foremost, believe in it! The foundation of developing your own intuitive capabilities is acknowledging that you have intuitive capabilities! Thought creates reality, folks, and if you keep telling yourself that you don’t have psychic abilities, well then that will be what you experience. The fact of the matter is everyone is born psychic. All being psychic IS, is being aware of and able to read and interact with energy. We are all made up of the stuff, so it’s only natural! It’s only as we progress in our cognitive development that we begin to form beliefs about reality which then limit our experiences of psychic phenomena. We’re using this mantra to create a new belief within yourself (and subsequently, new experiences). 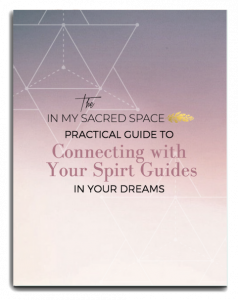 The next step – and the thing that will begin to solidify your new belief – is learning ways to recognize your intuition which are so subtle, you’ve been oblivious to or dismissing them all these years. Intuition can manifest itself in a number of ways and some of those involve physical sensations. You’ve heard people talk about their gut feelings as intuition, right? The reason behind this is that there’s a chakra located there between your chest and your belly button. It’s the solar plexus, and often when you have a gut feeling, you feel the sensation there. It’s the energy swirling in that chakra that you are feeling. The gut feeling tends to be a knowing. There’s a certainty to it and for me at least, it tends to be tied to things that happen in the future, or things that are happening right now, elsewhere, out of sight. When you know things that will happen in the future, it’s called precognizance. Another place you might feel intuition is in the chest where your heart chakra is located. That feeling is often times (for me at least) much more subtle than the gut feeling, but it is there and it feels like a tiny outward tug. Imagine a string tied around your heart, and what it might feel like if someone were to pull that string straight out, ever so gently. Feelings in the heart tend to be in relation to guidance, for me. It directs me to things that lead me in a direction or let me know that I need to recognize something as a sign. Telepathy sounds like one of those really “out there” concepts that most people probably couldn’t imagine doing, but I will go out on a limb and say that telepathy is probably one of the most common forms of intuition happening in your waking life right now – you just don’t realize you’re doing it. Have you ever had a random thought pop into your head that was no where near the train of thought you were currently on? Or said something out loud and had another person tell you they were just thinking the same thing? Or perhaps you were the one doing the thinking and they said it out loud? These are all ways that you may experience telepathy and your guides can often be communicating with you in this way, without you ever even realizing it. So the next time a random thought pops into your head, recognize that it could be coming from somewhere else. Prime time for receiving telepathic and especially clairaudient and clairvoyant messages is the in between stage when you are just falling asleep or just waking up. You’re conscious mind is far enough away that other things can slip in, but you’re conscious enough to hear it and remember it. Dreams, I would say, are probably the single most common form of intuition for most people. Everyone receives messages in their dreams. If you were to start interpreting all of the symbolism of your dreams, you would find that there are some very interesting and relevant messages being sent to you on a nightly basis. Start a dream journal and begin looking up your dream symbols in dream dictionaries like Dreammoods.com. One area that you may not regard as intuition but it is a form of intuitive guidance, is synchronicity. Nothing is a coincidence, so when you start to recognize patterns in things you see – numbers, animals, songs – and they really make you do a double take or think twice, these are messages and you should take note. This is probably the most often overlooked form of intuitive communication out there. These are just a few types of intuitive experiences to help you start recognizing your own intuition, there are many others out there! If you have any you’d like to share, comment and let us know! Check out my next post, How to Develop Your Intuition which will further elaborate on some tips and tricks for tapping into your intuitive self. Subscribe to my blog below to be alerted via email when my next post is published.